The Metropolitan Police arrested six Millwall fans during yesterday’s Championship match with Derby County at the New Den after an obscene banner was unfurled in the stands proclaiming Bolton striker Marvin Sordell to be a ‘c**t’ for reporting the racial abuse he suffered when the two sides met at the ground back in October. A 13-year-old boy was banned from the New Den ‘for the foreseeable future’ by Millwall after admitting he verbally abused Sordell (who also claimed on Twitter that teammates Darren Pratley, Benik Afobe and Lee Chung-Yong were also racially abused by fans) during the Bolton game – though, of course, it’s Sordell who’s the c**t in all of this. This was obviously seen as ‘grassing on a kid’ by the dumbarse Millwall fans in question, who quickly got to work – daubing their masterpiece with their washable felt-tip pens. The banner was quickly confiscated by stewards during the game, but thankfully not before the police got a good look at it. The banner was vulgar but it wasn’t racist. They’re entitled to their opinion but did they really expect to get away with that kind of language? The good old days when you could chant to the ref, “Your old lady is a w**** ” are long gone. Might upset those rattling their jewelery in the VIP boxes. Shame! While I have no desire to defend Millwall fans, it should be pointed out that he wasn’t found quilty of racial abuse. 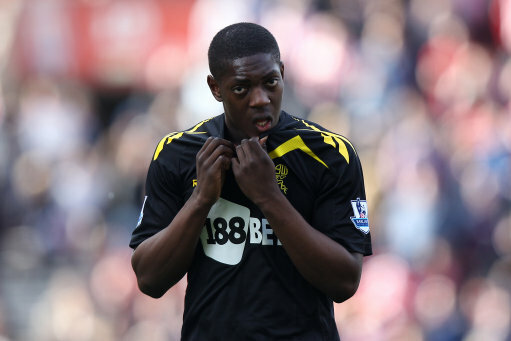 The 13 year old used abusive language towards Sordell, who then replied with similarly strong language. They missed out the word lazy, I’m a Bolton fan so I can say it! The stupidity of the 6 aforementioned is second to none!